Added on June 22, 2016 by ROSEGALLERY. Award-winning photographer Bruce Davidson's prolific body of work includes documentations of the 1960s Civil Rights movement and the gritty underbelly of New York City in the late 70s. He came to the Library this spring for a conversation with Academy Award-winning actor Matt Dillon, who is a great admirer and collector of Davidson’s work. In this riveting discussion between the two great artists, Davidson and Dillon talk about images, storytelling, and the joy of working in silence. Please visit NYPL for full video. Added on March 4, 2016 by ROSEGALLERY. UK Producer Midland speaks of his affinity for Bruce Davidson's Subway series with Electronic Beats, a T-Mobile affiliate, to share quality journalism and marketing of music & lifestyle content. "In order to contextualize the work and the environment in which it was born, one has to understand that the subway in 1980 was a place New Yorkers treated with equal parts fear and respect. For many people, it was their only way to get to work, to see family or to navigate the vast city, and so necessity often eclipsed personal safety." Midland also noted, "great artists show you worlds you thought you understood but in a way you never knew was possible." Harry 'Midland' Agius oversees two record labels, Graded and Re-Graded. Added on February 23, 2016 by ROSEGALLERY. Bruce Davidson (American, b. 1933) is one of the most influential photographers of the last half century. Working in both color and black and white, Davidson has documented subjects ranging from the civil rights movement to the urban grit of Harlem and the New York subway system. This exhibition presents a selection of 42 photographs and celebrates important gifts of vintage prints that will be exhibited for the first time since their acquisition in 2013. Davidson is known for his humanist outlook and a desire to engage directly with his subject matter, approaches that owe much to his early artistic influences in photography, including Robert Frank, W. Eugene Smith, and Henri Cartier-Bresson. Davidson’s projects include The Dwarf (1958), Brooklyn Gang (1959), and Time of Change (1961–1965), the latter of which chronicles the events and effects of the civil rights movement in both the North and the South. In East 100th Street (1970), he documented a conspicuously poverty-stricken block in East Harlem over the course of two years. Davidson followed this with Subway (1980), and in 1998 he returned to East 100th Street to document the revitalization, renewal, and changes in the neighborhood that occurred since he had last photographed the neighborhood. All of these significant series are represented in Bruce Davidson: Gifts to the Collection. The Hepworth Wakefield commissioned Martin to document the Rhubarb Triangle. To coincide with the opening of the exhibition, The Hepworth Wakefield will publish the book The Rhubarb Triangle. The monograph, available in February, includes all the Rhubarb Triangle images that will appear in the show as well as text written by Susie Parr. The show at the Barbican, curated by Martin, considers how international photographers from the 1930s onwards have captured the social, cultural and political identity of the UK. From social documentary and portraiture to street and architectural photography, the exhibition celebrates the work of leading photographers, including Bruce Davidson and Evelyn Hofer. Bringing together compelling photographs and previously unseen bodies of work, Strange and Familiar presents a vibrant portrait of modern Britain. On display at the Tate Modern is a selection of Martin’s photobooks reflecting an era of political conflict and social unrest across Latin America. Added on January 19, 2015 by ROSEGALLERY. It is a poignant time in our history that we take today to remember the important work and legacy of Dr. Martin Luther King, Jr. 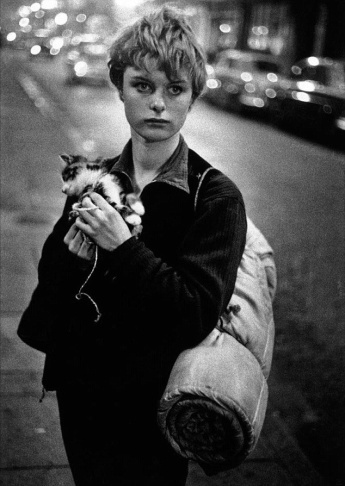 Illustrated in Time of Change by Bruce Davidson.